(21412.M106.1618.7, Z. P. Meyers/Barney Hillerman Photographic Collection, OHS). (21412.M108.27, Z. P. Meyers/Barney Hillerman Photographic Collection, OHS). Of Oklahoma's many lakes and reservoirs, most (and all of the large lakes) are man-made, created by constructing dams across streams. Most lakes were made for flood control, water supply, recreation, fish, wildlife, and/or hydroelectric power. Lakes on the Arkansas and Verdigris rivers also aid in maintaining navigation along the McClellan-Kerr Arkansas River Navigation System. 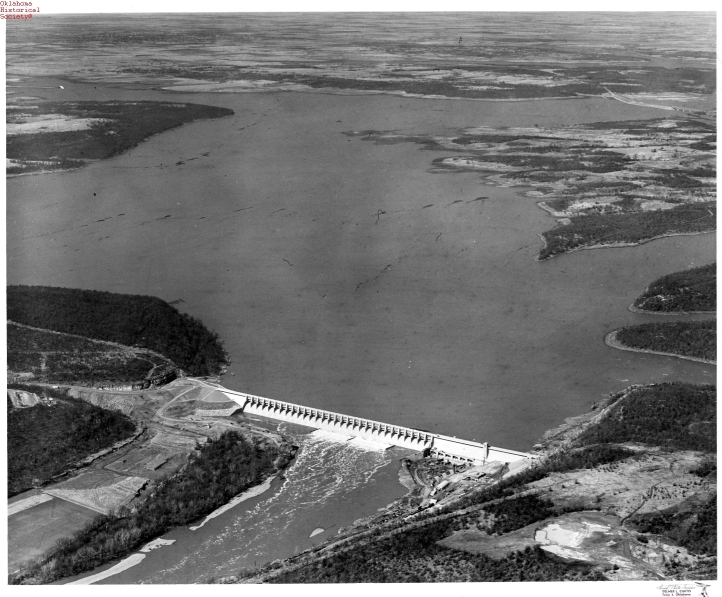 The major lakes in Oklahoma have been constructed by the U.S. Army Corps of Engineers, the U.S. Bureau of Reclamation, and the Grand River Dam Authority. Other large lakes are owned and operated by various state and federal agencies, by cities, and by other entities. Additionally, farmers and other landowners have built a great number of smaller lakes and ponds. 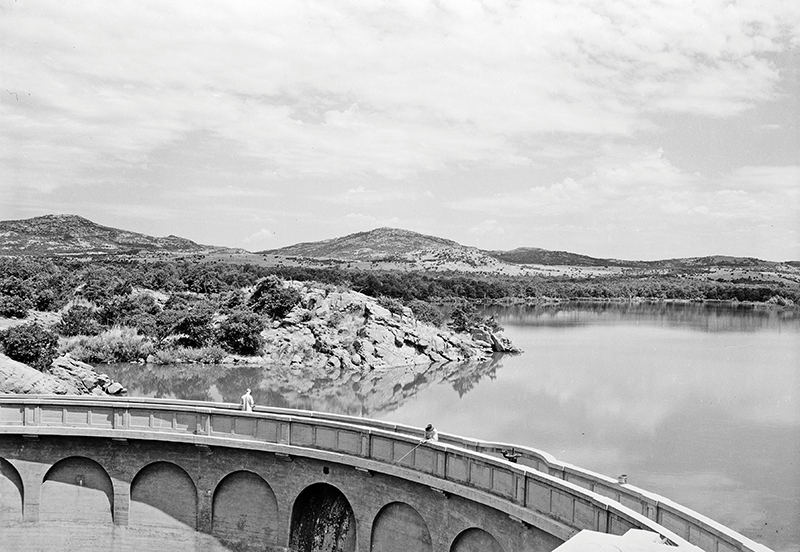 Lake Texoma (dam completed in 1944) is the only reservoir on the Red River in Oklahoma. It holds the largest volume of water (greater than 2.6 million acre-feet) in the state and has the second largest surface area (88,000 acres). Tributaries to the Red River have many other important man-made lakes and reservoirs, including (from west to east) Altus (1948), Foss (1961), Ellsworth (1962), Waurika (1977), Arbuckle (1967), McGee Creek (1985), Sardis (1982), Hugo (1974), Pine Creek (1969), and Broken Bow (1970); four of them are among the twenty largest lakes in the state. The Arkansas River has a series of locks and dams (the McClellan-Kerr Navigation System) that link Oklahoma with barge traffic from the Port of Catoosa (on the Verdigris River, northeast of Tulsa) down to the Mississippi River and New Orleans. Major man-made lakes and reservoirs on the main stem of the Arkansas River include (from the east) Robert S. Kerr (1970), Webbers Falls (1970), Keystone (1965), and Kaw (1976), each of which is among the twenty largest lakes in Oklahoma. Eufaula Lake (1964), on the Canadian River in eastern Oklahoma, has the largest surface area (102,200 acres) and the second largest volume (greater than 2.3 million acre-feet) in the state. Tributaries to the Arkansas River have many other important lakes and reservoirs (from west to east): Canton (1948), Great Salt Plains (1941), Hefner (1943), Overholser (1919), Thunderbird (1964), Carl Blackwell (1938), Hulah (1951), Skiatook (1985), Oologah (1974), Fort Gibson (1953), Hudson (1964), Tenkiller Ferry (1953), and Wister (1949), and ten of them are among the twenty largest in the state. The only natural lakes in Oklahoma are a series of oxbow and playa lakes. The typically crescent-shaped oxbow lakes are found in abandoned channels (oxbows) of a meandering stream and occur mainly on flood plains of the major rivers, such as the Red, Arkansas, Washita, North Canadian, and Verdigris rivers in eastern and central Oklahoma. Oklahoma has many oxbow lakes, but sixty-two of them cover at least ten acres, and the largest, near the Red River in McCurtain County, is 272 acres. Playa lakes form in shallow, saucer-like depressions scattered across the semiarid High Plains region of northwestern Oklahoma and the Panhandle. These water bodies are characterized by internal drainage and have no outflow. They hold water during and after rainy seasons, and most of the water is lost through evaporation and/or seepage into the ground. Only a few playa lakes last year-round, but the intermittent or ephemeral playa lakes number about six hundred and appear following thunderstorms. Kenneth S. Johnson and Kenneth V. Luza, "Rivers, Streams, and Lakes of Oklahoma," Earth Sciences and Mineral Resources of Oklahoma, Educational Publication 9 (Norman: Oklahoma Geological Survey, 2004). Kenneth S. Johnson, "Lakes and Reservoirs," The Encyclopedia of Oklahoma History and Culture, https://www.okhistory.org/publications/enc/entry.php?entry=LA010.